The booming tablet industry shows no signs of letdown, with shipments of the devices expected to more than triple this year over last, according to a study released by a London-based market research firm. In its report, "Tablets, Viva La Evolution!," Juniper Research estimated that tablet shipments will increase from 17.6 million tablets in 2010 to 55.2 million this year. How many of those shipped tablets will be sold, though, remains to be estimated. 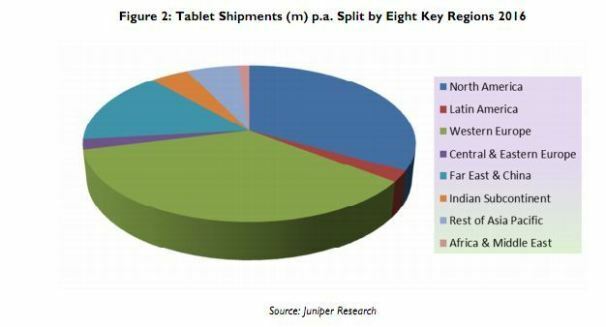 Juniper predicts that the tablet market will explode over the next five years, with shipments reaching 253 million units in 2016 -- more than four times what they are today. Most of those shipments will be in the developed world, which has the consumer spending power and wireless infrastructure to support sales of the devices. Lumped into Juniper's tablet predictions are electronic readers, which use displays based on electronic ink, rather than on liquid crystal technology. While LCD is superior for high-resolution video, electronic ink provides a more comfortable reading experience and utilizes less power. Demand for those kinds of slates is likely to remain viable, although major e-reader makers such as Amazon and Barnes & Noble are hedging their bets with their recent tablet releases, the report noted. “Amazon has done its homework: it knows there is not a one-size-fits-all device that makes everyone happy," observed the report's author, Daniel Ashdown. "While the iPad 2 -- which it sells -- is a premium tablet for Generation Y, Amazon has the wider market covered." Ashdown said Amazon’s new Kindles, priced from $79 to $149, offer a range of options, and the Kindle Fire ($199) offers a mass market alternative to the iPad and others. Barnes & Noble is also covering its bases with the Nook Color, a touchscreen LCD e-reader with an app store, he added. In the long run, however, hybrid displays which meld both LCD and electronic ink technologies could eliminate the need for dedicated readers, the report said.